I'm going to be honest here. I do not like New Years Eve. I never have, and probably never will. I'm not a drinker, and every New Years, that seems to be the theme. Now that I have kids to spend it with, I find myself tearing up, and hugging them to me as tightly as possible when the ball drops. I just get a flood of emotion at that moment, even though my heart really isn't into the party. This New Years Eve, we spent the night with my parents, several of my sisters and their husbands, some nieces and nephews, and some friends. We had a good time, and thanks to Lexie's late nap, and Dylan being wound up by his cousins, I got to hold my babies in my arms as the ball dropped. After that, we sent the kids off to bed, and sat around and talked until after 3 in the morning. It was the latest I've stayed up in ages! I felt very blessed to have spent the night with people I love so very much. New Years Day was a lazy day for us. We finally got dressed and dragged ourselves out of the house for dinner with my inlaws. The food was delicious, and it was a nice and relaxed setting. I dropped my sick hubby off at home, and stopped in to visit my family at their dinner, and wish my niece a happy birthday (Happy Birthday, Michelle!!!). 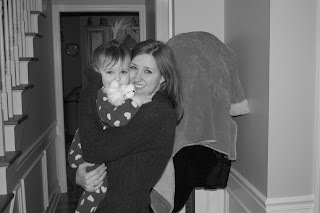 Once home, I attempted to get the kiddos back on schedule, by putting them to bed early, after a very non-routine week! For some reason, I was inspired to clean out and organize the pantry and the freezer. At 11:30 at night! Hey, whatever works, right? The kids spent New Years Day playing in a laundry basket, at their Nannie's house. Definitely made for interesting first photos of 2009!